A lot of collectors use cardboard 2x2's for storing their coins. They come in two types either self adhesive or the staple type. Personally I have moved away from both kinds for a number of reasons to the more versatile Saflips but this article is to help those collectors and newbies determine the 2x2 sizes to purchase for each type of Australian coin. The size suggestions below are just a guide and leave a small gap around each coin to allow for a comfortable fit of the coin in the holder and allow for you to view the edge of the coin. You can still of course use a slightly smaller size and you can always use a larger size to holder up the coins in your collection. The exception here is the suggested size for the 1937 and 1938 crown, the 39.5mm flip is the largest 2x2 size available. Again, these sizes are our experienced suggestions for use. 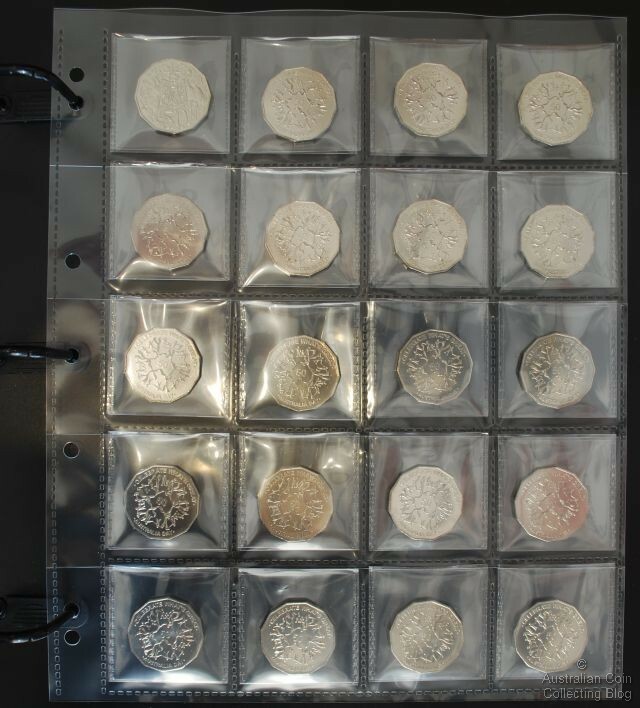 Nowhere before have collectors been able to purchase small portable coin albums that are PVC free(*). After months of research, design and prototype development The Purple Penny now have a non-pvc, secure and durable 48 pocket 8 page mini coin album available. Made from archival polypropylene this 2 ring mini coin album has cleverly designed pages which include a safety flap so your coin stays put! So many times before have collectors turned their portable coin albums upside down only to have 2x2's bouncing on the floor, even opening your backpack to find stray 2x2's not where you had left them. Lift the safety flap on the page, slide your coin inside the pocket -both cardboard 2x2's and Saflips are the perfect size and lay the flap down over your holder. The album cover also features fold and clip wallet design holding the album closed and your collection secure inside. It's so versatile that if you need more space then just add another page or if you damage a page then no need to throw out the whole album, just discard the page and add a new one. Attending a coin show? Take an empty mini album and fill it as you make your purchases. Meeting coinie friends for a coffee show and tell? Take your special coins and you know they'll be safe. This mini album is the perfect size to slip into your backpack, handbag or manbag! Because this album is made of archival polypropylene and stainless steel ring mechanism you can be sure that if stored in your safety deposit box or safe then no harm will come to your coins over time. This product is new, and has been designed by collectors to fit a need within the industry. The Purple Penny would love to hear your feedback, likes and dislikes about the product. Head over to the website and add a comment. (*) We don't know of any available (in Australia), do you? Q & A: What's the best way to store my PNC Collection? I collect alot of PNC Covers. And reading your articles I have become very worried about my collection. I have purchased many PNC & Medallion Cover Protectors from Australia Post. So do you know if these covers are safe or are they PVC. Currently when you buy these they are already inside theses clear Cover Proctectors. Your help will be very grateful. Please note that in the interest of anonymity we always remove names so that we can share our questions and answers with everyone. A friend contacts me a few days ago to tell me how upset they are about the condition of some stored coins. These decimal coins were taken from mint rolls about 12 months ago and holdered into adhesive 2x2's and placed into pvc flips to be offered for sale. Looking again at these coins 12 months later their condition is somewhat displeasing. The pvc has leeched through the quite thin mylar in the cardboard 2x2 and the coins are covered in a greasy film. Now completely disheartened over their condition which was once pristine but now considered damaged they have called on me for a shoulder to cry on. This got me thinking about our aspirations for the Purple Penny Project. You can read a detailed explanation about the project on The Purple Penny website but in a nutshell it's about removing pvc from in or near your collections because of the harmful affects it has on your coins. I saw a lovely complete set of 50c and $1 coins offered for sale on eBay a few days ago (and of course I can't find it again now). All coins were lovingly removed from their RAM packagings and capsules and broken out of pnc's etc, this method often destroying original packaging in the process. The coins were then placed directly into 30 pocket and 42 pocket pvc coin pages where the coins fit snugly and do look pretty. But, and the big but is you might fit a lot of coins cheaply into these sorts of pages but the pvc in direct contact with the coins will cause damage and a film to be left on the surface of the coin over time. You are destroying the coins putting them in these pages. We're also seeing damage to coins from the pvc not even being in direct contact with the coin surface (through the thin mylar of the 2x2). Another collector friend of mine has a set of uncirculated decimal coins they had lovingly collected over time meticulously picking out the best examples. They housed them in adhesive 2x2's in pvc pages locked in their safe over a period of time and upon returning to them their beautiful uncirculated example of a key decimal variety (worth thousands of dollars) had been damaged forever (as well as all the rest). I guess what I'm trying to say here is it's best to make the right decisions based on factual knowledge about what the products are made from that you choose to store your collections in. If the dealer doesn't know and can't tell you then go to someone who can. Ask specifically for non-pvc coin accessory products. If anyone's shopping habits are like my own then you'll understand when I say that I will be more drawn to something if I see it in use first. Whether this be on TV advertising where people are using a product or a piece of clothing I like displayed on a shop mannequin. Seeing an item or product displayed or in use helps me understand how it will be used or how it will fit into my lifestyle or even how it might look on me wearing it! So I thought I'd share with our readers and potential customers of The Purple Penny some of the ways people use and display their The Purple Penny products. Above is shown the simplest, easiest and most versatile way to house any coins of any size (up to 2x2). When using Saflips you only need one size holder, unlike when you use cardboard 2x2's where you need a variety of different sizes for all the different sized coins. They slip easily into the 20 pocket page and make viewing the coin particularly easy. Above is shown The Purple Penny 20 pocket pages fitting with ease into The Purple Penny Albums. Whether you choose to use our Saflips or Cardboard 2x2's the results are just what you need for the archival storage of your collection long term. If you prefer to have your collection close by for ease of viewing then The Purple Penny Albums stacked on the bookshelf is the right way to go. Storing the Albums horizontal takes the gravitational pressure off the album and pages which will give you longevity out of your albums. 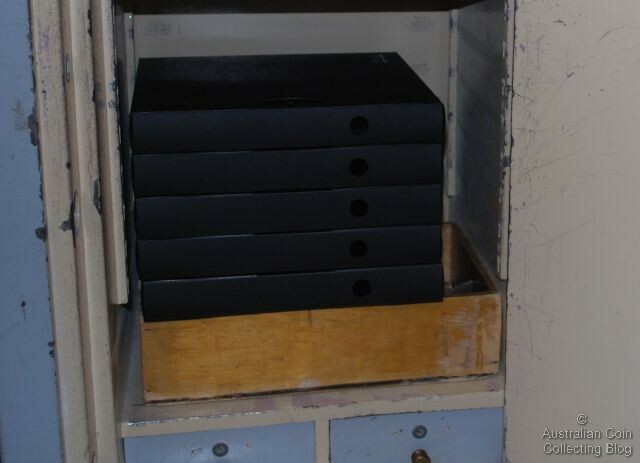 If security is what you prefer then The Purple Penny Albums can fit neatly into the safe to be stored securely and away from the risk of fire and thievery. 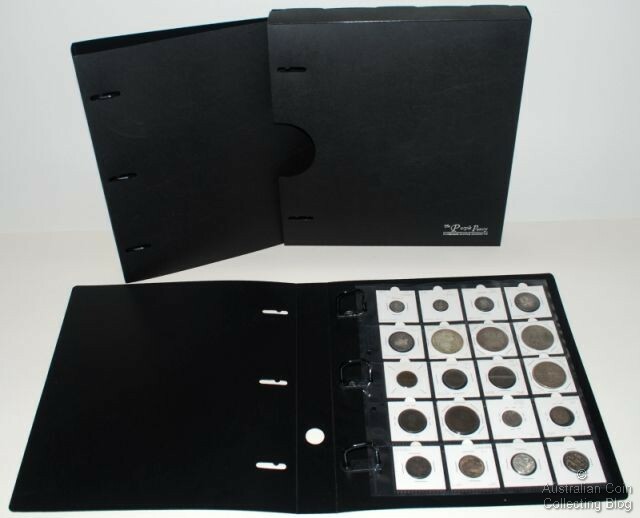 Generally we recommend that you can fit around 10 pages of coins into each album which equates to 200 coins per album. Stacking 6 albums (for example) means housing for 1200 coins! Quite a neat way of storing your collection, don't you think? We've just written an article on The Purple Penny website about using The Purple Penny storage products for other collectables such as a badge collection. The principles of storage for coins can be easily transferred to other types of collections. Have a read of our ideas for the storage of a readers collection. Sometimes, no matter how careful you are you'll find that your coins will develop toning or carbon spots while they are in your albums. 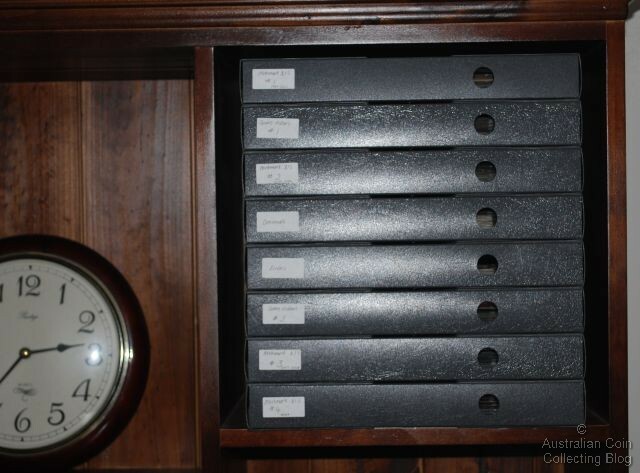 If you're a regular reader of this blog you'll know exactly how careful the authors of this blog are storing our collections, we make use of archival grade coin albums, PVC free coin album pages, and the excellent PET SAFLIP coin holders. Despite all of this I was interested to find a coin in my collection that had toned considerably since it was purchased about 2 years ago. You can see the reverse of the coin below, the image on the left was taken when it was purchased and the one on the right just yesterday. You can certainly see the difference! Closer examination of the large (and pretty ugly) toning spot on the coin indicated that it was a fingerprint. If you don't know it your fingers are covered in skin oils and these can certainly adhere to the surface of a coin and over time will etch and tone the surface of a coin and clearly this is what happened here. When I receive coins for my own collection I only handle them wearing cotton gloves so I was fairly certain that I hadn't left a big greasy fingerprint on this coin, so I took a closer look at the image of the coin from a couple of years ago. You can see the detailed comparison of the coin two years apart below. You can see that in 2008 the coin had faint toning in the centre of the coat of arms and traces of a fingerprint in the fields above the eagles wing. So obviously the fingerprint was there when I received the coin. It's also apparent that the coin had most likely been dipped at some time as the lustre was flat and a little un-natural. This wouldn't have concerned me as I buy these taler restrikes partly out of interest and partly because they are a fun (and attractive) way to hold silver bullion. So perhaps this past dip was designed to remove an old fingerprint? Well whatever the case, it didn't work as the toning in the centre of the coat of arms has darkened and spread and the fingerprint has bloomed horribly. So what are the lessons that can be learned from this? Handle all your coins when they are out of their holders wearing clean cotton gloves. At least then you can be assured that any fingerprints on a coin are not yours! Make sure you take a look at your collection regularly to keep an eye on the condition of your coins. If a coin is toning keep an eye on it, if red copper is going brown consider re-holdering it, and if coins are developing verdigris isolate those coins and treat them immediately. Take images of your coins when you buy them, you'll be able to refer back and see if they are changing. Consider giving all your new coins a quick rinse in acetone before storing them. This will not effect the surface of the coins but it will remove any residual oils and organic material from the surface of the coin. Use proper storage materials, remove PVC from your collection and use archival grade storage accessories. At least then you can be happy that any toning or change in the condition of your coins was a process that started before you obtained your coins. Remember that toning is often an active and on-going process and may have started before you got a coin and will often continue once you have it in your collection regardless of how you store your coins. So what could I have done to stop my 1780 taler restrike from toning like it has? Well I could have given it a quick bath in acetone when I got it in 2008 (and I may well have done but I don't remember). Given that I can see some toning on the 2008 image of the coin the process had probably started already. Acetone may have removed other oils on the coin and prevented the extent of the toning but I am sure the toning would have darkened anyway. From a storage point of view there's not a lot more I could have done, the coin has been stored in a SAFLIP, in a PVC free coin album page which was stored in an archival grade polypropylene coin album. I'll make a mental note to bring this coin out again in a year or so and take a look and see if the toning continues to progress. The coin hasn't been treated in any way so it should be interesting to see what it looks like in a year! We picked up an impulse heat sealer (seen above) recently (on eBay for approx $95) and have been testing it sealing coins into pages and flips. A heat sealer can be used to seal plastics such as Polypropylene (PP), Polyethylene (PE) and Polyethylene Terephalate (PET). We purchased a heat sealer so we can use it also to seal complete pages as well as the flips themselves. So far we have had excellent results. It uses inductive heating so there is no continuously heated element using less power and is safer to operate than a sealer with a continuously heated element. It simply heats a thin aluminium wire by induction for a short period depending on the setting selected and cools rapidly. It is a very simple and quick process which does not seem to emit any vapour or smells. These sorts of plastics are generally stable and dont contain any chlorine or softeners so when they're heated they don't release noxious vapours (unlike PVC). We sealed Saflips which are made from PET. These are double pocket flips. The second pocket is for a paper insert for labelling of your coin but we've found using it for a second coin and cutting the flip in half is a very cost effective storage solution. The cost of saflips is comparable with the cost of cardboard 2x2's so using them for 2 coins halves this cost. When sealing a coin in a saflip you need to ensure the coin isn't too big or bulging in the flip. The area to be sealed needs to be flat to allow for a neat airtight seal. Below are coins sealed into a single 2inch x 2inch Saflip. The heat sealer we purchased was a larger size which will seal up to 40cm. This would be perfect to seal in a whole page of coins without even the cardboard 2x2 or flip. Just slot the coins into the 20 pockets in the page and seal along the top of each row. Of course then the coins can't be removed or changed position without destroying the page. If you have a complete set or are happy with how the coins lay out then the cost for safe storage will be minimal. If you store the coins directly in the page with no 2x2 or flip then that cost is removed also with an acceptable option. When sealing the page as shown above, just sealing the opening in the page is not always the airtight option. Neither of the Purple Penny, Ultra Pro or BCW Polypropylene pages will give you a proper airtight seal as they are not sealed completely around the entire coin pocket. Storing a coin in a 2x2 will not give you an airtight seal, sealing the Saflip is the only option for an airtight seal. It is usually very difficult to get accurate information out of dealers or suppliers about what their coin accessories are made of. Often it is just assumed that they are coin safe because they are sold by these people specialising in everything numismatic. Even if you have some idea about the materials it still doesn't equate with the actual product and buyers are just left confused. We recently conversed directly with one of the biggest numismatic suppliers in the world to get accurate information about the products that they distribute around the world. The lining of the 2x2" coin holders is made of Polyethylene (PE) - not Polyethylene Terephthalate (PET). PE is vinyl-free and has no chemical softeners or acids. Generally, products that come into direct contact with coins are non-vinyl. However, the products for 2 x 2 holders that are listed all have vinyl pages. To decipher this information for you cardboard 2x2 holders are safe for coin storage but when you put them in vinyl (pvc) pages then you're in trouble. The pvc starts to deteriorate and produces acids that leach through the PE (similar to Mylar) and damage your coins. Coin pages sold as numismatic accessories from this well known supplier are pvc (vinyl) so therefore are not the appropriate form of storage for your collection. An alternative to 2x2 storage in pages are vertical inserts to place the coins directly into and these inserts are then fed into the vinyl pages...again, not an appropriate solution. The storage method you decide on really depends on what coins you have, what their value is and if and how you want to view them. Of the 2x2 options available we only use staple 2x2's and not adhesive 2x2's because of the risks of the holders opening and also the adhesive adhering to the coin surface and leaving residue on the coin. There are 2 types of staple 2x2's widely available in Australia. We have found the Renniks holders to be a better alternative because the window material is thicker and therefore more protective of the coin. It is not prone to tearing as we have found sometimes occurs with the Lighthouse one's. It's always wise to ensure there are no cardboard dust particles on the surface of the 2x2 when holdering up your coins as they may cause spotting on your coin over time. This being said, both these types of 2x2's are good options for bulk coin storage in polypropylene 20 pocket coin pages in polypropylene albums. Remembering it is unwise to store any of your collections near PVC. Another option for use in 20 pocket coin pages is 2 inch by 2 inch "Saflips" available from The Purple Penny website. These are double pocket coin flips. You can put the coin in one side and heat seal it in if you wish. The other side folds over and has a second pocket which could house your coins' description or information you wish to record. We've written an article on The Purple Penny website about how to use these Saflips. They slide easily into 20 pocket coin pages but do have a tendency to be a little loose -hold the page upside down and it may fall out. For this reason as with any coin holder we recommend your album have a slip cover so if a coin does come loose in the album then it is easily retrieved and not lost. The material used for both the Saflips and the windows in the cardboard 2x2's is Polyethylene Terephthalate (PET) . It is a polyester material which used to be called Mylar which was just a brand name used by Dupont. It is often still called Mylar by a lot of people. Some album pages and 2x2 holders are made from plasticised or unplasticised pvc. It is important to steer clear of these options. If in doubt then ask for clarification from your supplier or dealer. If you have expensive, rare and valuable coins in your collections then it's worth considering other options. We have found air-tite capsules are good. Kointains are another option but the inserts are punched for US sized coins and not Australian coins. After careful consideration of everything the approximate $30 cost of submitting a coin to PCGS for slabbing might well just be worth it for piece of mind, coin security and guarantee of authenticity the slab provides. It also provides a sound base for reselling your coin if you choose to do so. These options bring storage questions back into review. Hard plastic HDPE pages are available that house round capsules and slabs so these can be stored in albums.